The Chilbolton weather radar is able to measure the small scale structure of thunderstorms with unprecidented detail. By combining multiple radar scans, animations and 3D volume plots can be constructed. The top panel of the animation below depicts the radar echo intensity, with the red and purple colours indicating the regions of heaviest precipitation. The evolution of the storms can be seen as they are carried by the wind from west to east over a 1-hour period. The bottom panel of the animation shows the Doppler velocity, with red colours moving towards the radar and blue moving away. Strong ascending motion can be seen in the regions of heaviest precipitation. At the tropopause, the cloud spreads out horizontally to form cirrus anvil clouds. The circular shape of the cirrus anvil is shown in the volume plot below, which was compiled from 12 horizontal scans taken at different elevations at around 17:00. The red shapes within the cloud indicate where the rain rate exceeds 3 mm per hour. The animation below shows the rain observations from the Met Office radar network for the whole day. This is the same data that is shown in TV weather forecasts. Note how the storms develop during the day when the ground heats up and decay in the evening as the ground cools down. They are also much less frequent over the sea where the surface temperature stays roughly the same through the day. The visible and infrared satellite images from 15:00 are shown below. 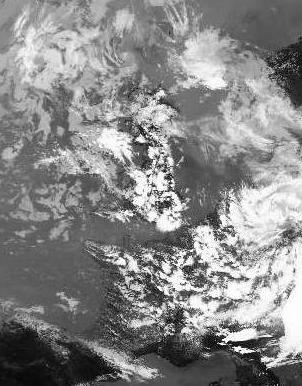 The satellite measurements show the cirrus anvils over Britain and France to be very reflective in the visible and very cold in the infrared (around -50°C in this case). 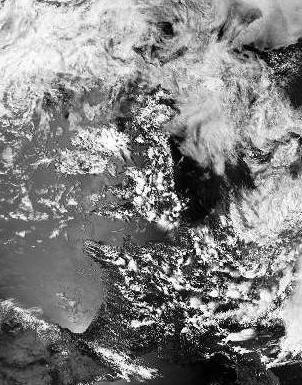 In the tropics the effect of cirrus anvil clouds on visible and infrared radiation makes them very important for climate. Read paper: Hogan, R. J., A. J. Illingworth and K. Halladay, 2008: Estimating mass and momentum fluxes in a line of cumulonimbus observed by a single high-resolution Doppler radar Quart. J. Roy. Meteorol. Soc., 134, 1127-1141. More images and information from this case study. See cold front case study.